Dr. Sanduk Ruit – Surgeon, Kathmandu, Nepal. Dr. Sanduk Ruit’s soul mission has been, and continues to be, to bring eyesight back to anyone who needs it, regardless of his or her ability to pay — and to do so with pre- and post-operative care that rivals the highest quality health care throughout the world. Dr. Ruit developed a sutureless form of cataract surgery, a technique that allows safe, high-volume, low-budget operations. A masterful surgeon, he can perform dozens of flawless cataract operations at eye camps over a 12-hour day. Working tirelessly at the operating table he says “the surgical chair is the most comfortable place on Earth that I have.” Dr. Ruit helped found the Tilganga Eye Centre in 1994. Tilganga treats 2,500 patients a week and surgery fees are waived for the neediest. Because many of the poor and blind cannot make it to Kathmandu, Dr. Ruit reaches out to them by trekking into remote parts of Nepal and throughout the Himalayas. Dr. Ruit and colleagues from Tilganga have worked as far afield as North Korea, Cambodia, Bangladesh, Vietnam, Ethiopia and Ghana (among many other countries). Sanduk Ruit was born in Olangchungola, Nepal, a remote village in Eastern Nepal. So remote the nearest school was a week’s walk away. And there were no health posts. Ruit’s sister died of tuberculosis when he was 17. This experience led him to become a doctor. Ruit excelled in his studies and completed a three-year ophthalmology residency at the prestigious All India Institute of Medical Sciences in Delhi, India. He then returned to Nepal. 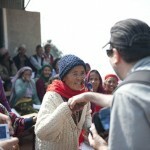 In 1980, while working on a Nepal Blindness Survey, he met Fred Hollows who became his mentor. Fred helped make his life goal clear: the restoration of eyesight to people who were unnecessarily blind. In 1986, Sanduk Ruit studied with Hollows for 14 months at Sydney’s Prince of Wales Hospital in Australia. Hollows and Ruit held the conviction that all people with treatable blindness have the right to restored eyesight; and further, that people in developing countries deserve access to the same quality of care and technology as people in the developed world. They also shared an ambitious vision: the elimination of avoidable blindness in the Himalayan region — driven by local people. 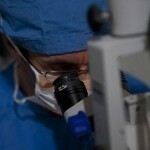 In Australia, Sanduk Ruit learned the latest cataract micro-surgery technique using implanted intraocular lenses. He was ready to take his knowledge to the poorest of the poor. Today he continues to trek through the most remote regions of Nepal conducting eye camps and restoring sight to thousands of the blind. Dr. Geoff Tabin – Surgeon, Salt Lake City, USA. Dr. Geoff Tabin is Professor of Ophthalmology and Visual Sciences and Director of the Division of International Ophthalmology at the John A. Moran Eye Center, University of Utah, Salt Lake City, USA. Dr. Tabin spends a considerable part of the year working abroad, both in Nepal and throughout the Himalayas, as well as in Africa. One of Geoff Tabin’s greatest passions, mountain climbing, directed him to his professional career. After summiting Mt. Everest, on one of his expeditions, he came across a Dutch team performing cataract surgery on a woman who had been needlessly blind for three years. It was then he understood his life calling. Tabin graduated from Yale University and then earned an MA in Philosophy at Oxford University on a Marshall Scholarship. From there, he took his interest in moral philosophy and health care delivery to Harvard Medical School where he earned his MD in 1985. After completing an ophthalmology residency at Brown University and a fellowship in corneal surgery in Melbourne, Australia, Dr. Tabin returned to Nepal to work with Dr. Sanduk Ruit. Dr. Tabin adopted Ruit’s methods for delivering high quality cataract surgery at a very low cost and began teaching other Nepali ophthalmologists while running the eye hospital in Biratnagar, Nepal’s second largest city. David Oliver Relin – Writer, Portland, USA. David Oliver Relin lives in Portland, Oregon. He is the author of the #1 New York Times bestseller Three Cups of Tea: One Man’s Mission to Promote Peace…One School at a Time , which was named nonfiction winner of the 2007 Kiriyama Prize, 2007 Pacific Northwest Booksellers‘ Book Of The Year, Time Magazine Asia Book Of The Year, People Magazine Critic’s Choice, and a BookSense Notable Title. Relin is a graduate of Vassar and was awarded the prestigious Teaching/Writing Fellowship at the Iowa Writer’s Workshop. After Iowa, he received a Michener Fellowship to support his groundbreaking 1992 bicycle trip the length of Vietnam. He spent two additional years reporting about Vietnam opening to the world, while he was based in Hue, Vietnam’s former imperial capital. In addition to Vietnam and Pakistan, he has traveled to, and/or reported from, much of East Asia. For two decades, Relin has focused on reporting about social issues and their effect on children, both in the U.S., and around the world. For his work as both an editor and investigative reporter, he has won dozens of national awards. His interviews with child soldiers (including a profile of teenager Ishmael Beah, who would later write the bestseller A Long Way Gone) have been included in Amnesty International reports. And his investigation into the way the INS abused children in its custody contributed to the reorganization of that agency. Relin is currently working on a novel about Southeast Asia and a non-fiction book about the quest to cure blindness.